Without any disrespect to the person or persons who took the time to design the "File/Scenery Download" menu option as it appears in the latest published release, it is not a good idea AS IMPLEMENTED, and the "Download Scenery" menu option under the " File" menu should be removed immediately, pending further development/refinement, so that it does not appear in the upcoming release of FG 2019.1.1 . Thank you for considering my suggestion for the betterment of the experience from the point of view of the end user. If it is removed how would you stop/start terrasync from inside the sim? I use that menu quite often when I have scenery (down) loading issues. It does what it says: start/stop downloading scenery with TerraSync. Necolatis wrote in Wed Apr 03, 2019 11:09 pm: If it is removed how would you stop/start terrasync from inside the sim? Hi Necolatis, the problem is that the "file/Scenery Download" option says nothing further about "Terrasync" or "Scenery". So, according to the language of the submenu options contained under "file/Download Scenery", the "file/download scenery" option has nothing to do with scenery at all. The point being that it contains very ambiguous language and therefore, for the end user, it is useless. If you found it helpful in order to use Terrasync in runtime, then you are one of the few. Isaak wrote in Thu Apr 04, 2019 4:10 am: I use that menu quite often when I have scenery (down) loading issues. It does what it says: start/stop downloading scenery with TerraSync. But it does not say " start/stop downloading scenery with Terrasync" . 1. " enable automatic download/update"
3. "download other data files"
Yet the file menu option describes all of this as " Scenery Download" . 2 . What does it mean to download " traffic" ? 3. 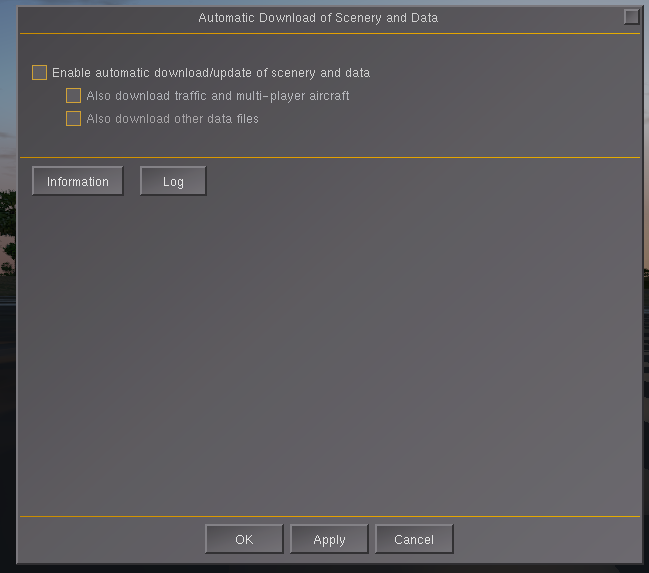 Why does "dowload multiplayer aircraft" appear under a menu that states " Scenery Download" ? Multiplayer aircraft are not scenery. 4. What are " other data files" ? And why does this option appear under the "File/Download Scenery" menu choice? The menu bar item " File/Scenery Download" should be removed from FG immediately. It needs to be reconsidered and reworked. The menu bar item " File/Scenery Download" should be removed from FG immediately. Assuming even half the rest of the world along with you has no clue what it does - why should it be removed? Does is accidentially wipe your computer harddisk if you're not careful? Does it install some harmful virus? No - actually the worst thing that can happen if you boldly check an option you did not understand is that you magically acquire FG scenery. Which, since the option was under Download Scenery, should perhaps not come as an utter surprise to the enterprising user. Thorsten, it's perhaps a good idea, a good notion, a good thought, but POORLY IMPLEMENTED. And it leads to confusion for the end user. Your response is well thought out and logical, but a bit pedantic. At the end of the day, the thing states "A" at entry but then delivers " B " in the fine print. That is not acceptable anywhere in civilized society, and surely not here in Flightgear. I don't know how to explain it more simply. Thank you for your response/feedback. p.s. if you want to make Terrasync "on/off" in runtime, then put the option in the Terrasync menu in the startup GUI under " settings", wherever it is that the user can decide to turn on Terrasync. A simple checkbox would do. Please don't mix it with other things. Please don't put it in a category under " File", then mixing it with " download traffic" and " download MP aircraft" and " download and update other stuff" . Please don't do that. Instead, please keep it simple. Last edited by FlyingHigh on Thu Apr 04, 2019 5:19 am, edited 1 time in total. It states 'Download Scenery' at the entry point and if you click it it delivers scenery. I don't really see the problem - what else do you expect to happen under a menu entry 'Download Scenery'? Thorsten I am sure that you are a very civilized person. But it does not deliver scenery. Please do your best to get this sub-standard implementation out of 2019.1.1 before 2019.1.1 is published. FlyingHigh, FlightGear is developed by volunteers who improve it on their own schedule for the features that they want to see themselves. The way you are ordering our core developers to invest their spare time in a feature that is working but has some wrong/missing words in your opinion really won't help your case. It won't happen. If you want to change something, do it yourself and propose your fix as a commit rather than stating that a feature is bad and should be removed without providing your fix. I - as both a user and a developer - need that menu to conveniently start/stop scenery downloads, so removing it is not an option for me. I don't see any reason why this single menu item would bother you so much. You aren't a consumer from a company that you've paid for. You are a user of free, open source software that fully enables you to modify the sim on your side in places you like but others don't. Case closed for me. I've just investigated this and firstly the Enable/Disable button isn't working right; as it doesn't take effect immediately; only after a reinint. I'll fix that. Also the dialog needs a bit of work as it doesn't accurately reflect the status; I'll make some changes. "download other data" can be removed - as it does nothing. "download traffic and multiplayer aircraft" should be renamed to "Download AI Traffic" as that's what it currently does. I'm going to make other changes to the dialog that are sensible to accurately reflect the status. FlyingHigh wrote in Thu Apr 04, 2019 5:23 am: But it does not deliver scenery. it absolutely does... check the one box and you get scenery... uncheck it and you don't... the other options are simpy additional items and they aren't working anyway so there's no harm there, either... wow! is it really so hard to understand that it takes two forums topics about it?? FlyingHigh wrote in Thu Apr 04, 2019 5:23 am: Please do your best to get this sub-standard implementation out of 2019.1.1 before 2019.1.1 is published. FlyingHigh wrote in Thu Apr 04, 2019 5:23 am: Thanks. John, I am impressed. I am actually happy you brought this up and it is going to receive some attention, in spite of your approach. @wkitty42 is right though, you would be better off if you think carefully about your chosen words and approach when wanting to make something better. After being around the project longer you realize why some of the "fine tuning" is put on the back burner. It's all volunteer.